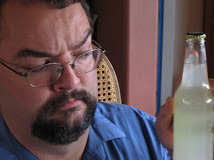 At the Weird Soda Review Lab, we are thankful for many things. We have several loyal readers, for whom we are thankful. We get to play around with blogs, for which we are thankful. We have the opportunity to explore a fascinating and diverse world of bubbly beverages, experiencing scents and tastes which expand our sensory horizons. We are pioneers, explorers, voyagers into every unknown corner of the soda universe, shining the light of knowledge and experience into the dark corners of quaffdom. For all of that, we are thankful. And there are several of those corners which we will NEVER HAVE TO VISIT AGAIN. And for that, we are profoundly thankful. Of course, these two gratitude-inducing qualities are somewhat incompatible, especially when those dark corners hold new examples of Weirdness. When such conflicts arise, what choice have we but to continue to quaff all that can be quaffed? This is, of course, made by the same company which produced Biotta Digestive Drink, one of the least palatable concoctions we at the Lab have ever attempted to consume. The scars of that encounter, like the rings left by the tooth-rimmed suckers of giant squid on the heads of sperm whales, still mark the olfactory and gustatory centers of my brain. Its foulness was of a magnitude sufficient to--had the bottle been a bit smaller--have collapsed the fabric of taste-time (which is always looking a bit tattered around the Lab) and resulted in a naked sodularity. Such are the hazards of our calling, but rest assured, loyal readers, we have learned from the experience and enhanced our safety protocols. Emergency bottles of high-quality vanilla and cherry cream sodas have been placed around the lab to stabilize the yummion fields. I believe that we are now properly equipped to sample another Biotta product with only minimal risk of catastrophe. Er...hold on a moment. A closer look at the label reveals that this is classified by Biotta as a "cleansing and fasting drink". Maybe I'll have the staff reinforce those cream soda compensators with a few well-placed root beer stabilizers. Color: Wow. I had assumed the glass of the bottle was opaque. It turns out (now that I've poured some into a cup) that it wasn't--the stuff is just a red-purple so dark as to be nearly black. I can tell it's red-purple because the inside of the bottle is coated with a thin layer. It doesn't bead up like a watery liquid; it seems to spread out, coating the interior of the bottle like some sort of obscene beet amoeba searching for prey. It's my understanding that wine connoisseurs will swirl wine around the glass to observe its "legs", the way in which it clings to the side. Doing so with this produces a transparent film of Biotta which clings...and clings...and clings. It very slowly slides off in a uniform mass, reluctantly, as if filled with the lost hopes of escape from its confinement and subsequent ravaging of the human world. Scent: Beety. The scent doesn't get far, I had to get my nose close enough that I was worried about attack, but it's strong when it's there. A powerful, concentrated distillment of beet. K-i-C: "Ugh. Smells like...onions and pomegranate. OLD onions and pomegranate. You should smell it, LAT." Recently, the K-i-C read a web site which translated the Chinese curses uttered on the magnificent cancelled-by-Fox-may-they-suffer-a-plague-of-aroused-hamsters science fiction show Firefly. One of them represents my thoughts on the taste nicely. "Holy mother of God and all her wacky nephews!" The initial taste, in the first second or so, is sort of like a thick grape punch with lots of citrus. And I do mean thick--it's roughly the consistency of cough syrup. However, the tastes which follow in the next few seconds escalate from worrisome to hideous. I actually found myself paralyzed, literally paralyzed, with growing despair and a sense of impending doom. It began with the citrus, which transformed from chorus of sprightly, laughing citrusy children into a horde of cackling, cavorting lecherous imps of tartness as it moved over the back of the roof of my mouth. That tartness transformed from fruity to acid/sweatlike. It was accompanied by a moderate vegetable bitterness, trampling over the tender meadows at the base of my tongue, leaving them a blasted wasteland of mud and broken dandelion stalks. Little bursts of sweetness could be seen, strongly in the initial taste and gradually fading thereafter. Aside from those, though, this was almost entirely unpleasant for me. 1) NOTHING goes better with cabbage. 2) That is a bit like saying "Death by cheese grater is awful. It would be better if you added a firing squad." Quaff rating: 1.5. Parts of it could almost be good. Those parts are the first to die. Cough rating: 3.5. I didn't puke, and didn't have to fight all that hard not to. The Lab has been faced with a quandary of late. Some time ago, the Kibbitzer-in-Chief spearheaded a new sub-project for the Lab; an investigation into the growth patterns and oviproduction of Gallus domesticus. Yes, we had decided to raise some egg-laying hens. We procured several juvenile specimens and acquired a used habitat (i.e. found someone giving away a free coop on Craigslist). The habitat was small, which was fine, given that we intended for the specimens* to free-range on the Lab grounds during the day. They grew well, and all was well. The back door to the main Lab building is left open during much of the day, as the official Weird Soda Review canine auxiliary staff** require unfettered access to the grounds to perform their duties (these include "barking at nothing" and "pooping in as many places as possible"). In order to minimize insect infiltration of the Lab, the open doorway is covered by a screen curtain held together in the middle by a magnet. The canine staff mastered the art of simply pushing between the screen flaps within a few minutes, and so had no trouble with it. The new lab chickens, however, were completely stymied by this incomprehensible barrier. Chicken #1: Behold, comrades! The large bipeds emerge from this opening with some regularity. Surely, beyond must lie untold riches and new places to poop. Let us voyage into the unknown. Chicken #2: Indeed. Forth Eggorlingas! Chicken #3: *hits screen* Alas! What is here, my faithful avian companions? My way is blocked by a mystic barrier. The light and scents from the paradise within drift out to tantalize and tempt me, yet I cannot pass! Ah, cruel fate! Chicken #2: 'Zwounds, it bars my entry as well. Whence comes such an impediment? Knowest thou, O wise leader of out feathered sisterhood? Chicken #1: Nay, it is altogether out of my experience. Never before has such a thing come to pass in the memory of any chicken. Let us investigate. Chicken #3: Truly, it is impassable. The mammalian bipeds and our canine foes must be possessed of some celestial virtue, unknown to hens, by which they can move freely betwixt this realm and that which lies beyond. Oh, cruel fate, which so oft is arranged against our ilk. Chicken #1: Verily, thou hast pecked it on the mark. Come, let us return to our efforts to uproot every vegetable planted by the bipeds. This dialogue was repeated every day. It was amusing to watch them utterly fail to figure out how to get through, and be so obviously annoyed that we and the dogs had no such trouble. Well, it was funny until they finally figured it out. Now we have to keep a constant watch on the door, lest the chicken hordes invade and explore the Lab. Inspired by this unfortunate turn of events, I have been busy constructing a larger habitat for the chickens (based on plans for the Garden Coop) in which they can spend more of each day in seclusion. Being a novice at construction, this has been occupying much of my attention, and I have neglected my Quaffmasterly duties. Well, no more. NO MORE, I say! No invading fowl shall keep me from the swift completion of my appointed rounds. Tonight we're trying "Foxon Park White Birch" soda. 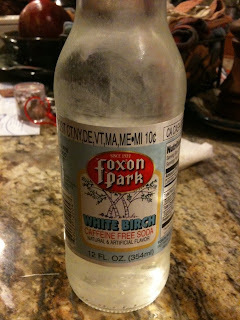 I'm presuming this is a birch beer, rather than some sort of soda made from whole birch trees. Where and when: Purchased at Urbn Pizza in Vista, CA. Color: Transparent, totally clear. The white/pale blue label color scheme, combined with this, gives it an icy aspect. Scent: Yep, it's a birch beer. It has that very strong scent of wintergreen. Oddly, though, it's underlaid with a savory, almost meaty smell. This is quite strange, and makes me a little afraid. Taste: The mint is the dominant taste, with a nice balance of sweetness. The sweet is not overwhelming; rather, it's a good complement to the mint. However, there don't seem to be any other tastes at all. It's very clean, but kind of uninteresting. No sign of meatiness, not even a bit of gravy or a blot of mustard. About ten seconds after the swig, a delayed aftertaste creeps in. It's a cooler, more pepperminty feeling, pleasant and faint. Other than that, there's very little aftertaste; cool mint, and a fading slight tart note which is the inevitable melancholy twilight to cane sugar's intense noontide radiance. I'm really not sure what to make of this. It leaves very little impression beyond a pleasant wintergreen mintiness. I suppose in its own way, that's nice; the cleanness is appealing in a way, and at least it's a pleasant taste, but it lacks complexity. It reminds me a bit of IKEA furniture. K-i-C: "Rest assured, it was quite expensive." Hmm. Perhaps I'm not sophisticated enough to appreciate what sets this apart from all other birch beers. It's nice--I wouldn't mind drinking it--but I probably would specifically request it. And I definitely wouldn't try to have it with most pizzas, it's far too weak. Quaff rating: 2.5. The taste is well-balanced and pleasant, but colorless. Cough rating: 0. There's nothing offensive here at all.